Yesterday I went on my longest artist visit – up to Stalham on the Norfolk Broads to see wood turner Dennis Hales. Actually, use the term ‘wood turner’ doesn’t really seem adequate to describe his work! 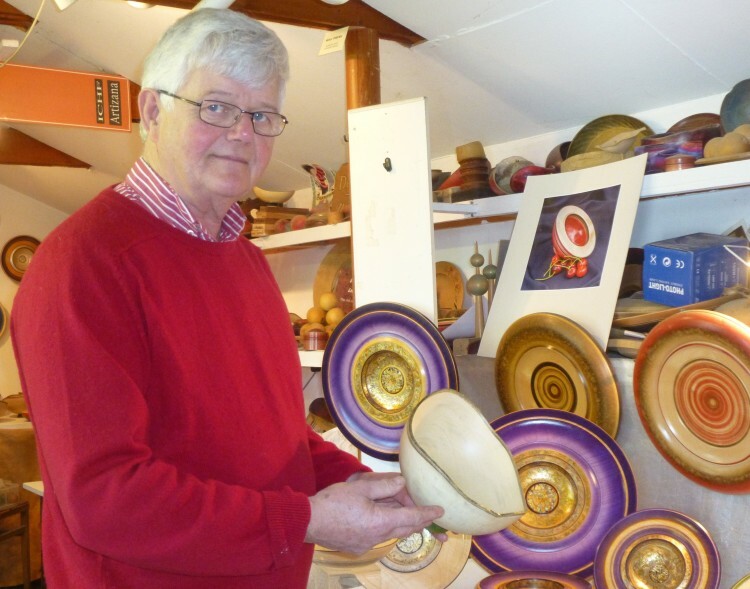 He uses water based dye pigments and metal leaf – gold, silver, copper and bronze – to enhance the natural features of the wood, and achieves the most amazing rich results. After a very welcome cappuccino had revived me after my two hour drive, Dennis took me out into the garden where he has a whole series of workshops – the first for drying the timber, the second for storing the finished work in a very controlled environment, and the third for doing the actual turning and decorating. In this last workshop he has a number of different lathes for different purposes, and everything seemed to be covered in a fine layer of dust! It very much reminded me of my Dad’s woodwork shop, with his lathes and tools, though on a much larger scale. Dennis told me that he uses sycamore, holly, ash and maple in his work, which he acquires locally. These are all very pale coloured woods, which offer a natural canvas for the wide variety of finishing techniques he uses. I am really looking forward to displaying this lovely work! After I left Dennis’ house I initially planned on going to Horning, but then I realised how close Horsey Wind Pump was, and changed my mind. Many years ago ( 1977!!!) when I first started teaching, I taught for four terms in Great Yarmouth, and on my walk to the school in the mornings I used to pass an art shop/gallery. For a few weeks that spring, they showed in the window a large watercolour of a sailing dinghy on the Broads. I used to stop and admire this painting, and started to think I could do that! So I got kitted out with watercolour tubes, and a pad of watercolour paper, and set off one Saturday in my little blue 2CV to find something to paint. 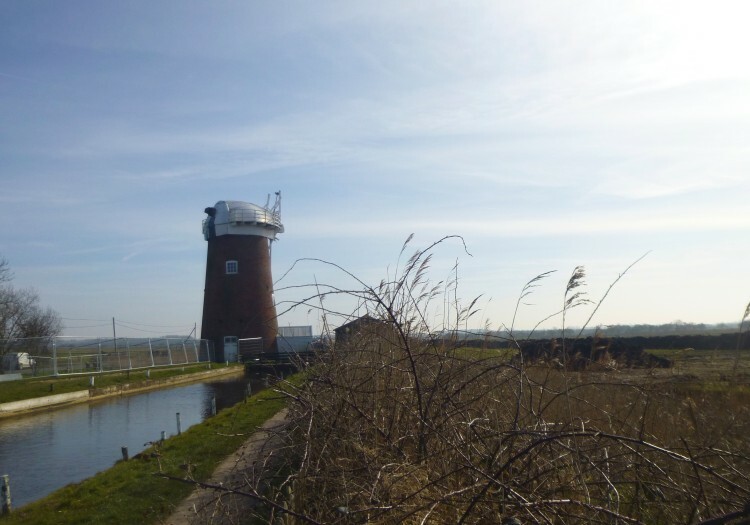 And the very first thing I tried was a painting of Horsey Wind Pump – and the painting was terrible! It had sails in those days, and, as far as I can remember, there was no car park – and no National Trust involvement. Lots has happened since then! !